Here at Domco, we provide a quality lawn mowing service designed not only to enhance the appearance of your garden but to take care of the grass too. Recognised as the lawn mowing Dorset and Bournemouth experts, we use quality equipment and practised techniques to ensure a fine finish – no matter the size and scale of your lawn. We work in a variety of conditions, determined that you deserve to have a great-looking lawn whatever the weather. Our professional gardening teams are recognised for their precision and take pride in their work. No longer do you have to worry about finding a lawn mowing service in Bournemouth. We extend to a range of Bournemouth areas and have an extensive base of satisfied clients! Contact us today to find out more. A professional gardener will come to your property fully equipped with all the necessary tools. Get expert recommendations on how to maintain your lawn in the best shape for longer. Enjoy your time in your beautiful lawn. And why not share it with your family and friends? People don’t know it is not enough to just use a mower to have a beautiful and green lawn. Which is why we offer a full lawn care service. This service may be a part of a gardening service or book separately. lawn mowing and trimming – just like everything else, this action has its own specifics and if done right, the results are far better. You may even harm the grass and in a few days, it may start to turn yellow. 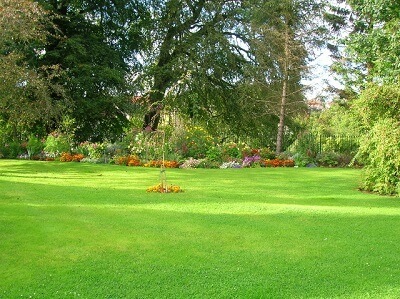 weeding – the professional gardeners will remove any unwanted weed and keep your lawn in a good condition. lawn feeding – this is the process of fertilising the soil the right way so you have a beautiful and healthy grass. Starting the warm months by feeding your turf will improve the growth, health and colour of the grass. This is not done on every visit so your regular gardener will advise you when it is most appropriate to do it based on your lawn condition. I tried to take care of my lawn by myself but it has always had this yellow-ish colour. I thought it was due to the Bournemouth weather but then I run into your website and I read it is due to unprofessional maintenance. So I decided to give it a shot with your lawn mowing service. I don't know what magic tricks you used but my lawn revitalised and looks amazing. I will definitelly become your regular customer!